Companies depend on the IBM ® WebSphere platform to deliver mission-critical Web applications and services and to provide the foundation for Service Oriented Architecture (SOA). To gain maximum value from WebSphere technologies, organizations must implement comprehensive, integrated best practices for managing their WebSphere infrastructures. 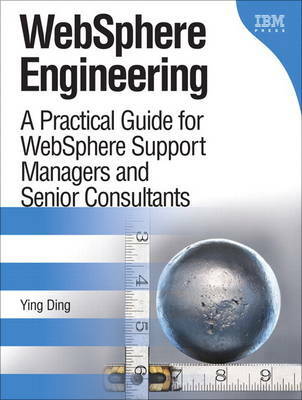 In this book, one of the most experienced enterprise WebSphere support managers introduces those best practices and explains exactly how to make the most of them. Drawing on his tremendous real-world expertise, Ying Ding shows how to maximize the WebSphere platform's reliability, stability, scalability, and performance for large enterprise systems. You'll find insightful discussions of each option and strategy for managing WebSphere, including practical guidance on making the right tradeoffs for your environment. Whether you're a WebSphere administrator, developer, consultant, support manager, engineer, or architect, this book brings together the information you need to run your WebSphere infrastructure with maximum effectiveness and efficiency.